Lead mining in Southern Scotland. 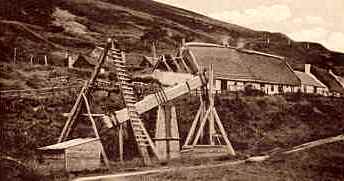 The beam engine at the former lead mine in Wanlockhead, c. 1900. This now forms part of the Lead Mining Museum. Photograph courtesy of the Wanlockhead Museum Trust. Inorganic lead compounds have been known to be a toxic hazard for many hundreds of years. Control of lead exposure at work is covered by regulations (Control of Lead at Work, or CLAW)38 which stipulate regular blood lead monitoring. Environmental exposure to lead has reduced considerably with the introduction of lead-free petrol, removal of lead from paint, reduction of lead in potable water supplies, removal of lead plumbing, and treatment of water to reduce plumbo-solvency. Nevertheless, lead poisoning can still occur, usually as a result of occupational exposure, in plumbers, stain glass window workers, paint strippers etc. Blood lead measurement provides a reliable guide to lead exposure. The industrial action limit, above which workers are legally required to be suspended from work, is currently 2.90 µmol/L (60 µg/100 mL).39 Lead inhibits several enzymes in the haem cycle and so concentrations of several porphyrins increase especially when blood lead exceeds 2.0 µmol/L. At about this concentration other effects may result such as fatigue, depression, irritability, cognitive impairment, headaches, weakness and constipation. More severe poisoning may cause anaemia, renal tubular dysfunction and peripheral neuropathy. Zinc protoporphyrin (ZPP) can be measured as an alternative marker although this analyte also increases in patients with iron deficiency anaemia. In children, lead may have significant neurological effects. Children are more prone to exposure since intestinal absorption is more efficient than in adults. Pica, the repetitive ingestion of non-food substances by young children, may present a hazard in poorly maintained housing with lead-based paint. The traditional remedies of a number of non-Western areas of the world may contain substantial amounts of lead and several instances of clinical lead poisoning by ingestion of Asian traditional remedies have been reported in the UK. Middle Eastern and Asian eye cosmetics may also contain lead, and their use on infants or by their mothers is associated with increased blood lead levels in the infants concerned. Ingestion of traditional remedies or application of eye cosmetics is now the commonest form of lead poisoning in children. The measurement of urinary lead is only recommended for monitoring of chelation therapy or for assessment of exposure to alkyl-leads. Blood: EDTA or lithium heparin (non-gel). Blood samples for occupational exposure should be taken at the end of a working shift. Contamination is associated with some paediatric containers and with some containers with rubber inserts or O-rings in the cap. These samples and lithium heparin gel tubes are unsuitable. Blood: Traceable to reference material produced in accordance with EN ISO 17511:2003 “In vitro diagnostic medical devices. Measurement of quantities in biological samples. Metrological traceability of values assigned to calibrators and control materials” and reference materials with values determined by reference laboratories. Blood lead: UK NEQAS, Guildford (once per month) and UK NEQAS Cd and Pb, Birmingham (once per month). ZPP: No EQA scheme available. Sample exchange carried out with three other UK laboratories. * One sample of blood is sufficient for blood lead and ZPP analysis. ** For assessment of lead in water, two samples are recommended; a first draw sample in the morning and a further sample taken after running the water for 5 - 10 mins. *** Absolute minimum volume; this volume is insufficient to carry out repeat analysis if analysis fails.